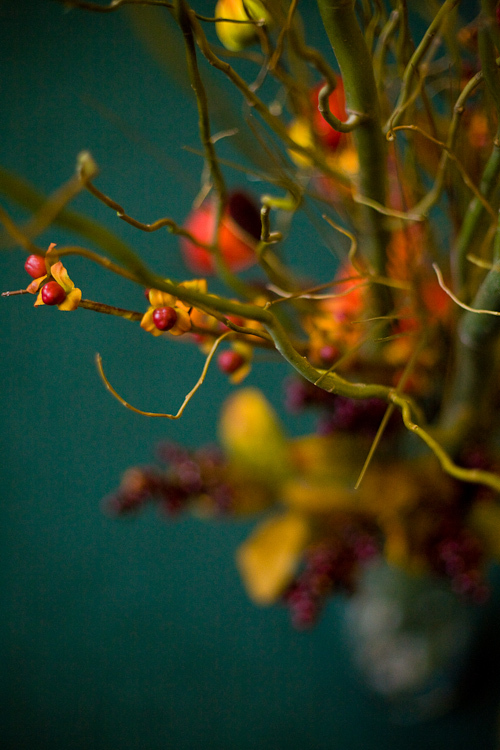 We are still a bit in love with our florist, Susie from Black Eyed Susie’s . When my mom and I first met her in her small storefront located in River Edge, I knew she was for us. Filled with energy, creativity, good ideas and best of all, a sense of humor, she immediately understood our “less-weddingy approach to our wedding.” I didn’t want white flowers or roses. I did want colors that matched my currant-red dress, but I wasn’t sure which ones. I needed input from an expert. She pulled out books with flowers and swatches and walked us through the whole thing, all the while taking notes. 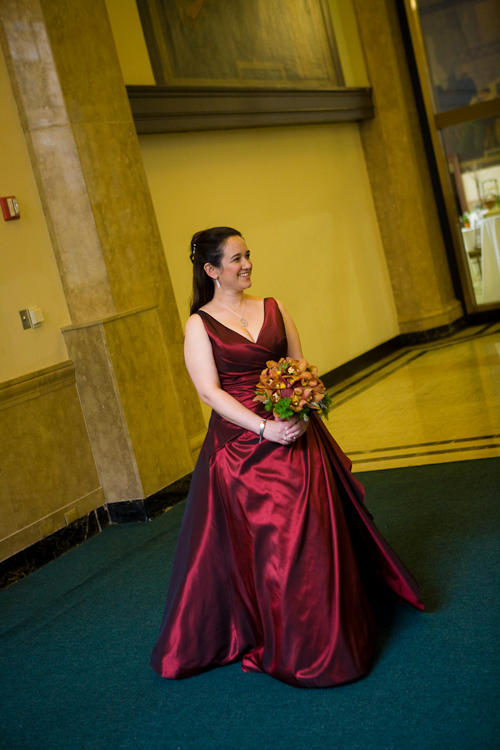 After one meeting, Susie crafted a vision that fit our space (very tall ceilings, art deco look) and the color of my gown. It was important to me to include food, beyond berries, in the floral decorations. My mother grew artichokes over the summer, dried them and Susie used them in my bouquet. Then, Susie used other artichokes in glass bowls and potted herbs in the cocktail hour space. She even sent us a website with the herbs listed so we could choose ones that we liked. I loved that I could be so involved in the process and help to personalize each detail. Since it was a fall wedding, I had the vague idea of branches and berries. 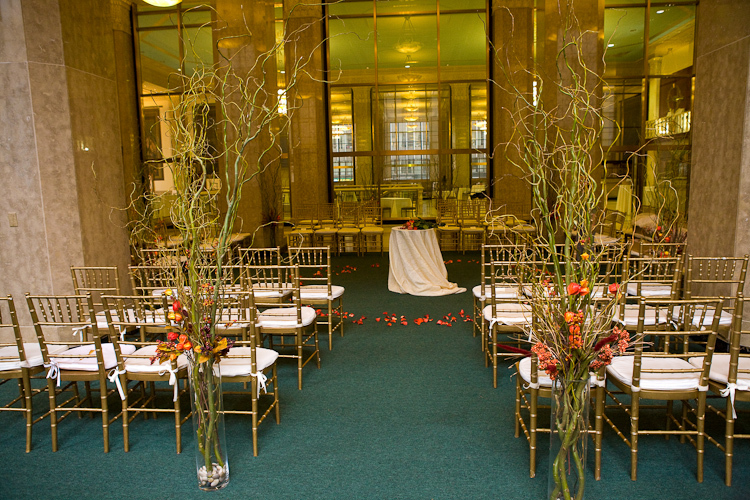 She used curly willow in the ceremony room, and elsewhere, and included even branches in the table centerpieces. We couldn’t decide between the two beautiful samples she created and ended up doing half and half. That’s how good she is. The Wonderful Women carried orchids that sprayed down against their black dresses. The men had matching boutonnieres and Susie was able to match my dress exactly for my groom’s flower. Susie gave my mom instructions on how to dry my bouquet and from my mother’s account in distant NJ, it looks great. My mom was also able to return to the venue after the wedding and pick up the flowers that were left behind by the guests. She has been enjoying arranging them at home. I look forward to driving them to our new apartment on the East coast after we move next summer. I highly recommend Susie to anyone looking to add a creative and natural touch to their setting. 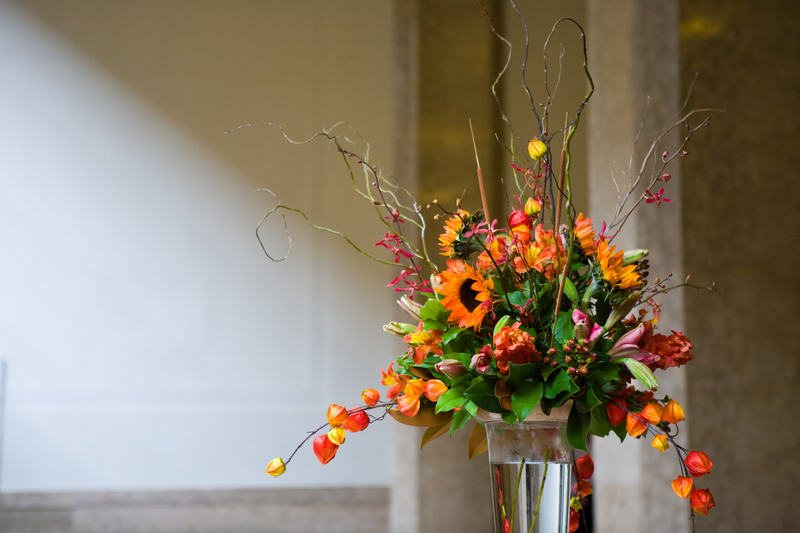 Unlike the other florists who gave me quotes very far outside of my budget, she fit our budget, asked questions and responded quickly when we had questions. Simply put, she is an artist who is fun to talk to. Susie is a member of The Weddings By Artists Network as is photographer Tony Richards, who took these photographs. Earlier this year I founded the Weddings by Artists Network. This Network brings together artists who craft unique and personalized items for weddings. Harpists, song writers, ketubbah painters, poets, photographers, celebrants, dress designers, bakers, book makers, cartoonists, and more can be find there. The most recent artist profile on the blog is with Sonia Gordon-Walinsky. Her specialties are hand-written and painted custom ketubbot and ketubbah prints as well as PasukArt, her unique creation of Torah artwork that connects a couple’s names with a biblical verse. You can see one of her pieces above. If you are looking to commission an artist for your wedding or a wedding gift, I recommend that you start with our national and regional artists. Introducing… my mother, Melabee M. Miller! We probably won’t do formal introductions at the wedding (no one is invited who doesn’t know us…) I would like to take this opportunity introduce you to my mother, Melabee M. Miller. An artist, she’s inspired me since I used to borrow her Sharpie pens and draw under her desk in a NYC industrial design firm as a child. She is an architectural photographer who was recently the principal photographer for the book, Can’t Fail Window Treatments. Some of you in New Jersey might have attended her book signing at Barnes & Noble in Springfield. Her botanical images have found their way onto art cubes and floorcloths. We have an art cube of every color and three floorcloths in our house. I love standing on the one by the sink. I bet you are wondering if Melabee is involved in the wedding industry. 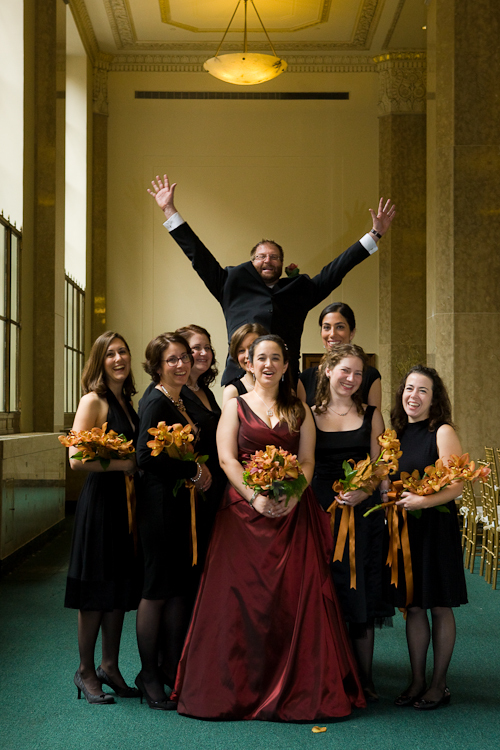 She recently joined Weddings by Artists, a group I founded for like-minded artists involved in the wedding industry. Her white cubes would make perfect favors. She recently started blogging and you can see monthly pictures (replacing her once-bi-monthly calendars). My favorite is the artichoke she is growing in her backyard in a Manhattan suburb – from a seed packet I brought back from Italia! Keeping with the art theme, my mom and I have collaborated on a number of projects. We created a manuscript of paired photographs and poems that narrate our family’s emigration from the small town of Sala Consilina in southern Italy to New Jersey in the 1800’s. We have published a number of poems and been invited to present the project at a number of academic conferences, but we are still looking for a publisher for the manuscript as a whole. If that isn’t enough, she is also the most helpful MOB (Mother of the Bride) ever. Considering how far away I live, she has had many things to do locally. Tomorrow, she is off to visit with the florist. Our next adventure? A mother-daughter trip to Santa Fe next week before I start a weeklong residency at the Ghost Ranch through the wonderful organization for women writers, A Room of Her Own. Stay tuned. Thank you for everything, Mamma Mia!